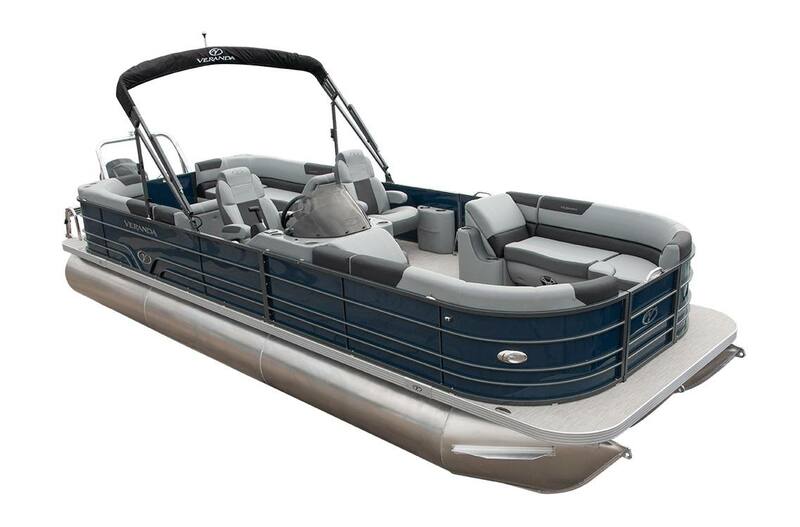 Why choose the Veranda Luxury Pontoons Relax RC Series? With the wrap-around luxury and comfort of four individual chaise lounges, the Veranda Luxury Pontoons Relax Series RC provides industry-leading value, time-tested style, and maximum Veranda seating built all built upon the Veranda difference. Relax in confidence, relax in comfort, relax in knowing you have made an intelligent, informed choice. Overall Length: 24 ft. 1 in. Max. Persons Capacity: 13 / 1,833 lb. Max. Weight Capacity: 2,647 lb. # of Tubes & Diameter: (3) 25 in. Fuel Tank Capacity: 40 gal. # of Tubes & Diameter: (3) 27 in. Overall Length: 23 ft. 8 in. Max. Persons Capacity: 11 / 1,551 lb. Max. Weight Capacity: 2,174 lb. # of Tubes & Diameter: (2) 25 in. # of Tubes & Diameter: (2) 27 in. Rough Water Package: .125 log upgrade and additional structural baffle per pontoon. Available with Deluxe and Luxury packages only. All measurements are approximate. All standard feature packages are available in bi-toon upon request.